World of Warships is Wargamings finest vehicle combat game, but its free-to-play model is getting prohibitively expensive. World of Tanks is a global phenomenon, and its success has become a new genre of sorts: the World War 2 vehicle shooter. World of Warships, the newest entry in the series after 2013’s World of Warplanes, is finally out of drydock and officially launched. Its mix of ponderous warships and huge guns—the biggest guns ever fired in anger by mankind—is beautiful, polished, and a joy to play. Warships is the most thoughtful Wargaming game so far, but its economy continues Wargaming’s pattern of expensive, exploitative freemium prices. Across the archipelagos of the South Pacific and the glacier fields of Alaska, the vessels of World of Warships duke it out. Unlike the dense urban landscapes in World of Tanks, there’s very little to hide behind. Unlike dogfighting aircraft in World of Warplanes, battleships are slow and vulnerable. Without the freedom to escape, turn, or hide, Warships places even greater emphasis on group tactics and positioning than its land and air-based siblings. Ships are controlled from an overhead view, as though the captain was hovering twenty feet over the central tower. Wargaming continues to be a dab hand at making controls that turn a complicated war machine into an accessible, keyboard-friendly vehicle. The rudder and throttle controls are designed to be set and forgotten, as though a subordinate had an order yelled at them while the captain worried about other things. Planning ahead is key for Warships. Especially in larger boats, bringing guns around to face an enemy takes a minute. Knowing that enemies will most likely come from the East, and planning accordingly, gives captains time to get pointed in the right direction with the explodey-parts facing the bad guys. This same slowness also makes flanking especially effective in Warships: sneaking around an island to come up behind a ship gives the crafty tactician a solid 30 seconds of free punches while the victim’s cannons rotate around to counter. I had one particularly tense battle at the helm of the USS Montana, a truly monstrous battleship with guns as big around as my car tires. An enemy cruiser flanked our lead position and started making trouble, so I rotated my twelve barrels of kickass and started aiming down the gunner sights. In my narrow field of view, he sailed straight toward me. As the distance closed I measured his range on tiny hashmarks, leading the target from ten kilometers away. His profile was tiny and constantly shifting. Though it pained me, I kept taking single shots instead of unleashing my entire battery at once, trying to get my aim just right. Each time, my shot fell just short or just off to the side of his vulnerable hull. Then, he made a mistake. To better engage me, he turned his fat broadside my way and stopped closing the distance. With a huge, wide target sitting at a set range, I took one more targeting shot. When it landed smack amidships, I enjoyed an evil smile and fired all four batteries at once. Twelve 16-inch shells, each weighing about three tons, arced across the sky and dropped on his head like the fist of an angry god, sinking his ship in one volley. If this had been Counter-Strike, I would have just landed a head-shot with the AWP. I got the same sense of satisfaction, even if it did take about five minutes to fully play out. There’s an art to angles in Warships, and it tickles the tiny, forgotten part of my brain that experiences math as a form of pleasure. (I’ve tried to subdue that part of my brain with booze, but alas, it remains.) With guns mounted all down the body of a ship, facing broadside to an enemy is the best way to unload on some poor sucker. Unfortunately, going broadside also shows the enemy team a huge target to shoot at. There’s a sweet spot at around 30 degrees that brings all guns onto a target while minimizing exposure. Instead of doing a barrel roll or hiding behind a bombed-out church, this mental geometry is how captains stay safe on the oceans. And because boats can't pivot instantaneously, it takes pleasant intuition to pull off. 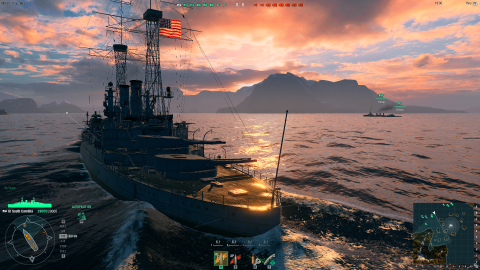 I’ve mentioned it in passing already, but Warships looks incredibly good. Even as pretty as it is, it comes packed with graphics options that should tone down enough for less powerful rigs to run it. It includes support for multiple monitors and a variety of native resolutions. “Sky and Clouds Quality” and “Sea Rendering Quality” would sound like esoteric settings for minutia in any other game, but in Warships half of what the game renders is water or sky. On my GTX 970, I had no problem getting a solid 60 frames per second on the highest quality settings. There’s a huge variety of gadgets and weapons to play with, from scout planes to emergency repair crews. Each of Warships’ four ship types (destroyer, cruiser, carrier, and battleship) drive differently. Some are slower, more powerful, or pack smoke screens and deadly torpedo spreads. The most unique is the aircraft carrier, which carries no ship-to-ship guns at all. Carriers are commanded from an overhead view as the flight deck manager, ordering flights of torpedo boats to attack enemy battleships or sending fighters to intercept enemy bombers. Playing a carrier feels like a slow-moving RTS has been welded onto the side of a different game, and I don’t think the native view works very well. Looking down on the carrier with a zoomed-out camera leaves out all the information I need to make decisions, so my carrier experience was spent almost entirely inside the tactical map screen. To break up the monotony, I enjoyed watching from the attacking warplanes’ perspective, but it's mostly a passive experience. Even so, after a few hours of pounding distant cruisers with artillery, dispatching torpedo sneak attacks was refreshingly new. All four types of ship also come in multiple tiers representing the advances technology brought to these war machines. The carrier is a good example: the lowest tier is a converted coal tanker, the USS Langley, with a deck covered in canvas-winged bi-planes. Carriers evolve up through the USS Lexington to the USS Midway, a late-War behemoth. There’s no denying that high-end vessels are crazy fun to play. As the Japanese giant Yamato, I terrorized the local battlefield, parking myself in shallows with a clear line of sight and raining explosive hell down on half the server. As the Midway, I hid behind a volcanic island just meters from the fighting, sending fighters and bombers overland and back again, picking the enemy apart. The trouble is that most players will never see these late game ships. World of Warships is Wargaming’s most expensive, grind-heavy meta-economy yet. These ships are expensive, and playing at the highest tier is going to devour time and money. In order to research and then buy all of the ships required to play as the Midway—and then the Midway herself—I’d need to spend about $177 total. Grinding the XP (which isn’t purchasable) that you need to unlock the Midway would likely earn a fair chunk of in-game currency, but not enough, so that's more grinding to do if you want to avoid paying. Meanwhile, you also need to use in-game currency to repair ships and reload guns. The USS Langley’s quaint biplanes are slow and weak, but their torpedo attack isn’t messing around. Researching all of the American carrier branch costs over 700,000 XP, which I estimate would take me between 1,500 and 3,000 games—a truly interminable grind. Earning XP and in-game currency would be faster with a Premium account, which can be had for $90 per year or $11 a month. Premium ships like the $38 USS Atlanta can be bought at any time without spending time on XP. It’s laudable, I guess, that unskilled players with cash to spare can’t just outright purchase the best ships in the game (they can buy pretty good ones, but not the best). The ship tiers themselves function as a type of matchmaking filter as well, so people in the biggest ships are going to find themselves against the best players around. To be fair, you do get a lot of ships fairly quickly. Most players will have no problem unlocking the first four tiers of ships, which gives access to all four types of ship and a lot of options. But after that tier, prices go up exponentially. It's unfortunate that so much of this game’s wonderful art, the gleaming steel decks and rusting hull panels and black-bored guns, won’t be seen except by a narrow sliver of die-hard fans. For the rest of us, playing Warships for free at the lowest tiers offer a great tactical puzzle and an unusual take on the online team deathmatch. Finally sinking a troublesome battleship with a well-placed volley or torpedoing a carrier from behind is incredibly rewarding. Gorgeous lighting and water effects gently reflect infernos of burning steel. It’s a game that I want to come back to again and again. The lowest tier ships are fun, and that’s good—most players will probably only see the first three or four levels. With so much amazing art and incredible history in the biggest ships, though, I just wish that more of us could see everything Warships has to offer without an aggressive, expensive grind. Pretty nice weather for getting shot at. Most of the game is played inside the gunner’s sights, lobbing shells. Japanese and American ships intermingle, but their flags keep flying. The Japanese Hashidate is a capable entry level ship with two massive gun platforms and quick engines. Lobbing broadside shells over a teammate is a good way to concentrate your firepower. You can watch the battle and issue commands from the perspective of in-flight attacking planes. The Yamato suddenly realizes she’s about to take a full spread of torpedoes in the side. Whoops.